A radically funny and original take on the horror movie genre of kids who rent a cabin in the woods. A very good movie, this one is not for the weak-stomached as it lampoons the cabin in the woods horror tropes, including all of their usual gross out moments. What works for this movie is that it is not going after individual jokes from those other films, but instead finds a way to turn the whole genre on its head (kind of like Cabin in the Woods did.) Here, it is all about misunderstanding. These two hillbillie nice guys are mistaken for mass murderers by a group of teenagers and what follows turns into a series of attacks where the teens keep dying accidentally. Meanwhile, our main characters, Tucker and Dale, have no idea what is going on. The only negative about this movie is that it is all built around one single, on-going joke, but boy does it handle that joke well and make it last for the entire duration. Ever since Deliverance and The Texas Chainsaw Massacre, the hillbillie backwoods people that are on the outskirts of society have been used for horror. The movies would bring a bunch of visitors to the area who were taking a vacation trip, and had no idea what they were getting into. There were even staples of this genre, such as the run-down convenience store that the main characters come to at the start of the movie, as a warning sign that they should turn back now and not go any further. In the early 2000s, the genre got molded a little more, and new staples were added to it. One is that the main characters now have to be teenagers or college students. Another, is that there needs to be a secluded cabin where these kids are staying. There have been three movies during that time frame, which all follow these rules and fall into the genre. There was Cabin Fever, which was about a virus that ate away at people, The Cabin in the Woods, which was about all of the horror movie icons coming to life, and now, Tucker & Dale Vs. Evil, which is a spoof on everything that has come before it. 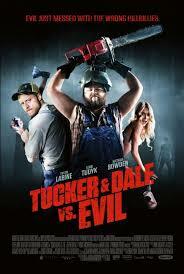 Tucker & Dale Vs Evil is a movie about misunderstanding. It’s a movie about kids who go out for that usual cabin trip and end up suspecting that the two men, who are also staying in the area, are killers. Tucker and Dale are these two men. They happen to be very nice guys who are just a little slow-witted. Especially Dale, the overweight one. These two guys are so excited about their relaxing vacation they have planned together and how they are just going to head out to the lake for some peaceful fishing. And then everything goes wrong. The movie starts us out with the kids. It then keeps us with them for the first handful of scenes. That’s an interesting choice, considering that they are not the main characters, but it’s a smart one. Positioniong the film in this way makes us fall for the curveball even more when Tucker and Dale turn out to be great guys, and just totally misunderstood. Even from very early on, when the college kids walk into the convenient store and Dale goes over to the ones who are standing outside, you can see this movie has the right idea up its sleeve and is all about having fun. Dale is interested in talking to the girls in the group. Tucker encourages him, saying he just needs to be confident and go over there and laugh and smile. So Dale goes over, only he has a scythe in his hand and looks like a psycho, laughing away at something the girls have no idea about. This is the first of many mixed signals and wrongly interpreted scenes. It gets better. For the first night, the college kids make a camp fire and tell scary stories. Chad tells them about a killer in these woods who was never found and about how there was a huge massacre one night. Then they decide to go skinny dipping in the lake. 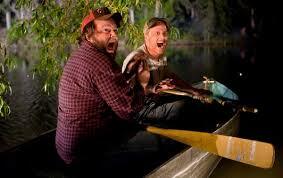 Meanwhile, Tucker and Dale get their supplies together and take a boat out for some late night fishing. Chad and Allison, one of the girls in the group, are the last to join the others, because Chad takes a moment to come onto Allison, telling her that the two of them are better than everyone else. She is less than interested. Now, it’s Tucker and Dale out on the lake and Allison stripping down and climbing up a rock to jump in and join her friends. Tucker and Dale spot her, and when she sees them, she freaks out, slips, and falls into the lake, unconcious. The two of them paddle their boat over to her body and rescue her. Only the friends see all of this from the other side of the lake and it looks very different to them. Their friend, Allison, isn’t moving, and these two creepy guys are pulling her lifeless body onto their boat. Dale shouts to the kids, “We got your friend,” and instead of sounding like the message of help that he means it to, it ends up sounding more like a threat. So begins the tale of horror and mayhem. The guys bring Allison back to their cabin and take care of her. They put her into bed, make her food, and do whatever they can to help her recover. Only her friends think that she has been kidnapped and now begin their attacks on these two hillbillies. One of the friends drives off to get the police, but the others decide not to wait and instead to try to handle the situation themselves. A series of crazy circumstances ensue that lead to these kids dying in all kinds of accidents. One kid gets impaled by a tree branch that he runs into. Another one jumps at Tucker and goes head first into a wood chipper. Still another runs at them with a hand carved spear and ends up landing on it himself. All of these deaths are grotesque, but also hilarious. Especially since neither the kids, nor Tucker and Dale, have any clue of what is actually going on. For our two protagonists, they come to the conclusion that these college kids have all just come out there to kill themselves and have decided to do it right in front of Tucker and Dale. Watching the series of errors in judgement and misconceptions of the situations build up is a lot of fun. When Tucker gets attacked by bees, for example, it causes him to go wild with the chainsaw in his hand, and look like a madman killer waving it around. When Dale brings Allison a plate of pancakes and she freaks out, he assumes it’s because she hates pancakes and not that she is afraid of him. All of this works flawlessly because our two lead actors sell it so well. While the movie does have only one ongoing joke that it is built entirely around, it finds new and clever ways to build and expand on it throughout the film. What we get is a very smart and crazy horror spoof.